"Please don't kill the child. I want the child. Please give me the child. I am willing to accept any child who would be aborted, and to give that child to a married couple who will love the child, and be loved by the child. 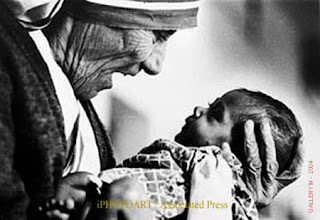 From our children's home in Calcutta alone, we have saved over 3,000 children from abortions. These children have brought such love and joy to their adopting parents, and have grown up so full of love and joy!" February 1997 - National Prayer Breakfast in Washington attended by the President and the First Lady. "What is taking place in America," she said, "is a war against the child. And if we accept that the mother can kill her own child, how can we tell other people not to kill one another."